Nico Hischier could play a prominent role early on with the Devils. As the season begins and the players take the ice, it can often mean seeing the league’s future superstars take the ice for their first time in their career. Most of the rookies that play in the season are the ones that make the roster after training camp, and some definitely do stand out more than others. Last season was headlined by now all-star players in this league such as Auston Matthews, Patrik Laine, Zach Werenski, Mitch Marner and Matthew Tkachuk to name a few. This season just as great of a rookie list has made opening night, and these are some of the names you should be looking out for to win the Calder Memorial Trophy. Everyone who watches hockey knows Nico Hischier at this point. First overall selection in the 2017 NHL Draft and has impressed many during the preseason scoring seven points in only four games, four of those seven points being goals. Due to this very impressive preseason, Head Coach of the New Jersey Devils, John Hynes has made it clear that Hischier has proven himself worthy of a Top 6 role with the Devils, and will most likely be playing alongside newly acquired Marcus Johansson and Drew Stafford on the second line. Hischier is also expected to be centering the first line powerplay alongside Johansson, Hall, and Palmieri. Basically, Hischier is being put in every scenario possible to succeed and have a great season. Some downsides to this is the fact that he plays for the New Jersey Devils who ranked 28th out of 30 for Goals For last season and ranked 22nd on the Power Play at 17.5%. However, the addition of Marcus Johansson from Washington should add a little bit more of an offensive spark to the lineup as well as of course Nico Hischier. As it stands right now, Hischier has proven himself to be a goal-scoring threat in the QMJHL with the Halifax Mooseheads racking up 38 goals in 57 games. 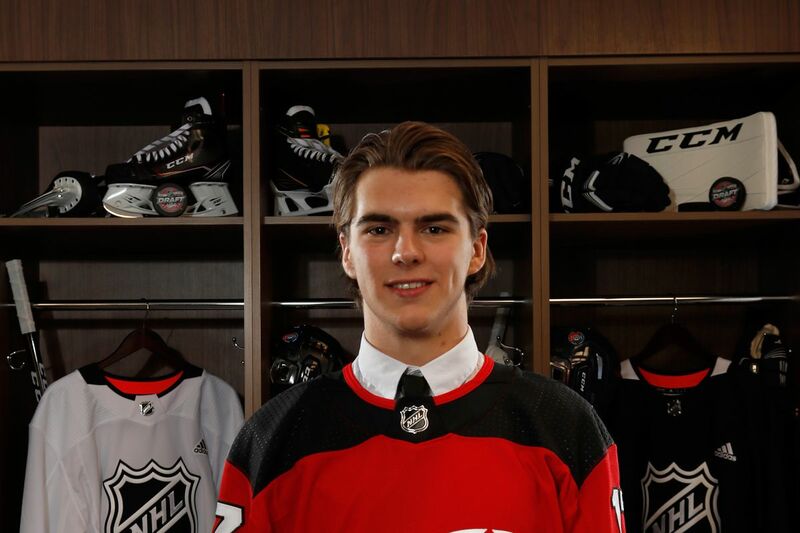 Our prediction as it stands is that Nico Hischier gets 22 goals and 36 assists for a 58 point season and could easily stand out as a Calder candidate. Clayton Keller is among a cavalcade of prospects that the Coyotes have amassed under GM John Chayka and Keller is arguably the best of all of them. Clayton Keller was the 7th overall selection in the 2016 NHL Draft and has turned some heads. Last season, Clayton Keller amassed an impressive 45 points in 31 games for Boston University in the NCAA which as an 18-year-old, is extremely hard to do. Along with his very impressive college season, he also has impressed immensely during this preseason, amassing 8 points in 4 games. Head Coach of the Coyotes, Rick Tocchet, has clearly trusted Keller from his preseason showing and has been placed on the first line RW alongside Max Domi and Derek Stepan. Keller, unlike Hischier, however, is only playing on the 2nd Power Play unit alongside Dylan Strome and Christian Dvorak. With Tocchet being a brand new coach to the Arizona Coyotes, Keller could benefit from the advantage of a new system as he will be learning how to play said system for a small part of the regular season with the rest of his teammates. Keller’s linemates of Domi and Stepan could really benefit his production as well, and for that reason, we believe Clayton Keller will get 23 goals and 38 assists for a total of 61 points. Charlie McAvoy is arguably the best defensive prospect going into the 2017-2018 season with Thomas Chabot being sent back down to the AHL and could be a standout contender for the Calder trophy. McAvoy was the 14th overall pick in the 2016 NHL Draft and has done a very good job making a good impression with the Bruins management. McAvoy already has experience in the NHL by playing in Round One against the Ottawa Senators in the 2017 NHL Playoffs and played very well. He combined for an average 26:12 minutes of ice time per game during the 6 games and totaled 3 assists while doing so. McAvoy is also coming off a very successful season from Boston University racking up 26 points in 38 games as an 18-year-old defenseman. Head Coach Bruce Cassidy clearly trusts McAvoy and this was evident in the playoffs. This has allowed him to crack the opening night roster on the third defensive pairing alongside Kevan Miller, however, if provided could move up to the top pair and the current injury to Torey Krug could open a spot up for him. He’s also been trusted playing on the second powerplay unit alongside Matt Beleskey, David Backes, and Frank Vatrano. Unless McAvoy gets top minutes, his path to a Calder trophy could be very challenging and we could possibly see him get 6 goals and 28 assists for a 34 point season as a rookie defenseman. Boeser went under the radar for a large part of his young career solely because of his draft position, however, he’s looking to change that narrative this season. Brock Boeser was the 23rd pick in the 2015 NHL Draft and had quite the successful season with the University of North Dakota last season. He racked up 34 points in 32 games and also played 9 NHL games for the Canucks last season scoring 4 goals and 5 points. Boeser turned some heads this preseason, leading the Canucks with 7 points in 5 games and easily cracked the opening night roster. Boeser is projected to start on the second line alongside Bo Horvat and Sven Baertschi and is also projected to play the 2nd Power Play unit alongside Loui Eriksson and Bo Horvat. Vancouver finally committing to a rebuild will allow Boeser to get as much ice-time as possible to succeed and with the potential of Bo Horvat, we can see Boeser scoring 26 goals and 29 assists for a total of 55 points. Jakub Vrana, like Boeser, has gone under the radar in terms of media coverage and is looking to finally take the step from the AHL to the NHL. Jakub Vrana was the 13th overall pick in the 2014 NHL Draft and has spent a large majority of his hockey career in the AHL with the Hershey Bears. However, his numbers have been very impressive as he has totaled 75 points in 88 games with the Bears but has just been unable to transfer that talent to an NHL level. That is expected to change this year as Vrana has been put in one of the greatest scenarios to succeed as he’ll play alongside Alex Ovechkin and Evgeny Kuznetsov on the first line as well the 2nd Power Play unit with Brett Connolly and Andre Burakovsky. In the SHL and in the AHL, Vrana has proven himself to be a young skater with a good shot and we could see him picking up 25 goals and 26 assists for a 51 point season. His lack of quality numbers in the NHL may result in a demotion to another line, however, if he can produce, those predictions might end up being totally wrong and could hit 60+ points. My favorite this season to win the Calder Memorial Trophy for best rookie of the year would have to be none other than Clayton Keller. He arguably has some of the best linemates of this years’ rookies and is also being put on a power play with solid young players with upside. Some other names to look out for however would be Joshua Ho-Sang of the Islanders, Tyson Jost of the Colorado Avalanche and Kyle Connor of the Winnipeg Jets.